Issue 5 is out - and here comes our YouTube channel... — STRONG. It's been a while since I posted an update and told everyone what's been going on with STRONG. In the 12 months that have elapsed since we first launched our Kickstarter, STRONG has been steadily growing and now has subscribers all over the US and the world. 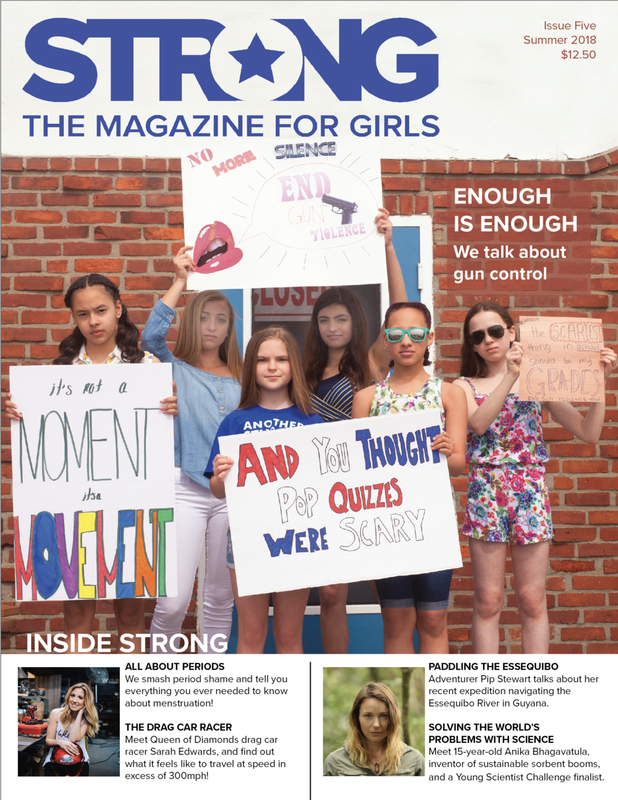 Thank you all so much for your support as I try to grow this empowering and inspiring magazine and make it available to more girls. June 15th saw the publication of issue 5. In this issue we showed that we weren't afraid to tackle some tough issues. We led with gun control, perhaps one of the most important issues that our youth face. For many adults this is about politics, but for the youth of today, this is about being able to go to school without being scared of being shot. High School senior Emily Kesselman wrote a powerful piece on her views on gun control, and we highlighted inspirational youth including Emma González, Naomi Wadler and Yolanda Renee King. Issue 5 also featured a HUGE segment all about periods! Half the world has a period and yet it's still such a taboo subject. We wanted to help to #smashperiodshame by really talking about menstruation. We had a Q&A from pediatrician Dr. Kristen Stuppy, as well as a look at how products for dealing with your period have evolved throughout history, what it's like to get your period if you live in other countries around the world, and we topped it all off with some great STRONG girl reviews of some period products—everything from menstrual cups and reusable cloth pads, to great apps for helping you figure out when your period is due and why you're craving carbs! We always like to feature some inspirational women in STRONG, and this summer was no exception. We spoke to drag racing car driver Sarah Edwards about her passion for driving at 330mph (! ), and to adventurer Pip Stewart about her amazing expedition to Guyana where she and two other women became the first people ever to canoe the Essequibo river from source to sea. Talk about STRONG women! We highlighted 15-year-old Anika Bhagavatula, a young scientist who has invented a sustainable sorbent boom for mopping up oil spills, and we also took the opportunity to feature some other young, incredible, female scientists. There was a STRONG skills piece showing how to safely prep for a great picnic with friends (and featuring some very yummy recipes! ), and we travelled to Uganda to interview Ndagire Fridausi, a young girl growing up there. All of that combined with quizzes, poetry, reviews and all the other usual ingredients went into making this a truly GREAT issue of STRONG! As well as printing our magazine, I'm working pretty hard to try and build up a community of girls and their parents who feel passionately about empowering the next generation. We have been working to extend our presence on social media, posting inspirational messages and images to people who follow us on Instagram and Facebook. We also have a new Facebook group that is open to girls (who are old enough to be on Facebook) and their parents or guardians. The group is called the STRONG Girls' Group and is designed to be a community page where everyone can post items to do with female empowerment. If you're not already a member, I'd encourage you to join us. We welcome posts that highlight STRONG female role models, girls taking part in interesting activities, and any other post that helps us all to work together to inspire. If you have a story to tell, share it with us there! Our next major project is going to be the STRONG YouTube channel. This past few weeks we opened up auditions for STRONG Girl Presenters—girls between the age of 11 and 21 who are passionate about female empowerment, who share our values, and who would like to help us to empower and inspire others. Just today we notified the 6 lucky winners and over the next few weeks and months we'll be introducing them to you and starting to highlight their videos as they post on our channel. We're so excited to be involving more girls in our work! Subscribe to our youtube channel here, and watch us as we grow it! Older PostIssue 4 out now!